Sam's Schematic Collection Components - HTML, Diagrams, and Photographs. High Voltage Power Supplies - Home-built and commercial units. Jacobs Ladders - Construction, parts sources. Assorted High Voltage Circuits - Bug zappers, range/oven/furnace igniter, air cleaners, ultrasonic cleaner. Simple Power Supplies - Wall adapter based, 1.5 V Alkaline cell eliminator, PC Boost. Switching Power Supplies - Sample circuits from Panasonic VCR and SVGA monitor. Inverter Circuits - Fluorescent lamps, 12 VDC to 120 VAC. Strobe Circuits - Stroboscope, Kevin's Strobe Schematics. IR Detector/Tester Circuits - Photodiode and receiver modules. Radio Frequency Circuits - Power oscillator. Basic Light Dimmer Circuits - 2-way, 3-way, kludge #3251. Heating Appliance Schematics - Toaster oven. Rechargeable Appliance Schematics - Flashlight, tooth brush, NiCd and lead-acid types. Miscellaneous Circuits - Astable multivibrator, pushbutton clock, random neon flasher, etc. Back to Sam's Schematic Collection Table of Contents. Many of the circuits have been reverse engineered - traced from various schematics or actual hardware. There may be errors in transcription, interpretation, analysis, or voltage or current values listed. They are provided solely as the basis for your own designs and are not guaranteed to be 'plans' that will work for your needs without some tweaking. Some of these circuits operate at extremely lethal voltage and current levels. The energy storage capacitors in even the smallest disposable camera flash operating from a 1.5 V AA battery can be deadly under the wrong conditions. Line powered devices - including little ones - may have an added danger of high power at high voltage AND are often non-isolated (no power transformer). Do not attempt to troubleshoot, repair, or modify such equipment without understanding and following ALL of the relevant safety guidelines for high voltage and/or line connected electrical and electronic systems. Before thinking about experimenting with anything using or producing high voltages or connected to the AC line - even opening up a disposable camera that may have been laying around gathering dust (the capacitor can still be charged - outch! ), see the document: Safety Guidelines for High Voltage and/or Line Powered Equipment. Something that looks innocent can really ruin your entire day! Perhaps the larges collection of all sorts of on-line schematics and links in the explored universe can be found Tomi Engdahl's Lights and Electronics Page. Laser power supplies and other laser related schematics will be found in the document: Sam's Laser FAQ: Safety, Diode Lasers, Helium Neon Lasers, Drive, Info, Links, Parts. Additional electronic flash and other strobe related schematics will be found in the document: Notes on the Troubleshooting and Repair of Electronic Flash Units and Strobe Lights and Design Guidelines, Useful Circuits, and Schematics. Information on isolation transformers (essential for safety) and variable transformers (Variacs), series light bulb adapter, and other Incredibly Handy Widgets(tm) for your test bench will be found in the document: Troubleshooting and Repair of Consumer Electronic Equipment and possibly in the specific document for each type of equipment. General nifty gadget and other pack rat stuff can be found in the document: Salvaging Interesting Gadgets, Components, and Subsystems which identifies useful components which may be removed from common consumer electronics and appliances as well as unconventional uses for their subsystems, modules, or replacement parts. See the Home and Mirror Site Locations for other possibilities which may be faster from where you live. This basic circuit is capable of supplying up to 30 kilovolts or more from a low voltage DC source using a flyback (LOPT) transformer salvaged from a TV or computer monitor. Typical output with a 12 VDC 2 A power supply or battery will be around 12,000 V. Current at full voltage is typically around 1 to 2 mA. Higher currents are available but the output voltage will drop. At 2 kV, more than 10 mA may be possible depending on your particular flyback transformer. This circuit uses a pair of 555 timers to provide variable frequency variable pulse width drive to an inverter using a flyback transformer salvaged from a black and white or color TV or computer monitor. At very low repetition rates, it will produce individual sparks. At high rates with a low uF value high voltage capacitor, the output will essentially be HV DC with a specific value dependent on input voltage, pulse rate and width, and load. None of the component values is critical. The particular transistor used for Q2 seemed to be zappier better than a common horizontal output type but they work as well. The input voltage can range from about 5 to 24 V. Using a flyback from a MAC Plus computer which had its bad primary winding excised, an output of more than 20 kV was possible (though risky since the flyback is probably not rated for more than about 12 kV) from a 24 VDC, 2 A power supply. By adjusting the drive frequency and duty cycle, a wide range of output voltages and currents may be obtained depending on your load. With the addition of a high voltage filter capacitor (0.08 uF, 12 kV), this becomes a nice little helium neon laser power supply which operates on 8 to 15 VDC depending on required tube current and ballast resistor. See the document: Sam's Laser FAQ. The transistor types are not critical. Those were selected basically because I had them in my junk box. A TV or monitor horizontal output transistor (HOT) should be satisfactory for the chopper but will require good strong drive. The lower voltage, high current transistor I used (2SD797) has both a higher current and higher Hfe rating than typical HOTs. Even a 2N3055 will probably survive and not be too bad in the performance department. The drive transformer is from a B/W computer monitor (actually a video display terminal) and has a turns ratio of 4:1 wound on a 5/16" square by 3/8" long nylon bobbin on a gapped ferrite double E core. The primary has 80 turns and the secondary has 20 turns, both of #30 wire. Make sure you get the polarity correct: The base of the switching transistor should be driven when the driver turns on. You should be able to wind a transformer similar to this in about 10 minutes if a similar size (doesn't need to be exact) core is available. Where the flyback includes an internal rectifier and/or you are attempting to obtain the maximum output voltage of a specific polarity, the direction of drive matters as the largest pulse amplitude is generated when the switching transistor turns off. Since flyback transformers are not marked, you will have to try both possible connections to the drive coil. Use the one that produces the higher output voltage for a given set of input conditions (drive and pulse rate/width). Many variations on this basic circuit are certainly possible. The dual 555 circuit can be reduced to a single 555 with some loss in flexibility (unless you use the cute non-standard modification that allow independent adjustment of the high and low times - left as an exercise for the student). One nice thing about running it at 24 VDC or less (as opposed to line voltage) is that it is much more difficult to let the smoke out of th circuit! The 5 A power supply I was using shut down on several occasions due to overcurrent but the only time I blew the chopper transistor was by accidentally shorting the base to collector. Get the schematic for HVGEN32 in PDF format: HVGEN32-SCH. Evertron Model 3210 Gas Tube Power Supply is the schematic of an inverter type unit for driving a neon sign. It has a pair of power MOSFETs driving a flyback style high voltage transformer, with a whole bunch of open-wound primaries and a potted secondary. Get the schematic for RI-3E1 in PDF format: ri3e1sch.pdf and ri3e2sch.pdf. The adjustments on each section are for the current limit, not output voltage as might be expected. The output voltage for each section is set by fixed resistors (one of which is inside the potted HV module). Output C (5.3 kV) is approximately Vref*R101/(R8||(R12+R13)). Output T (5.7 kV) is approximately Vref*R121/(R28||(R32+R33)). It would be a simple matter to replace R12 or R32 to vary the C or T output voltages within a modest range (like 4 to 6 kV). But going too high is asking for smoke. :) If pots are used, make sure their maximum value will limit the output voltage to something reasonable. The climbing arcs of old bad sci-fi movies are always a popular item. Just make sure you understand the safety implications before constructing one of these. See the document: Safety Guidelines for High Voltage and/or Line Powered Equipment. Many modern gas stoves, ovens, furnaces, and other similar appliances use an electronic ignition rather than a continuously burning pilot flame to ignite the fuel. These are actually simple high voltage pulse generators. Where starting is manual (there is a 'start' position on the control(s), a set of switch contacts on the control(s) provides power to the ignition module. A problem of no spark with only one control indicates that the fault is with it or its wiring. A problem with continuous sparking even with all the controls off or in their normal positions indicates a short - either due to a defective switch in one of the controls or contamination bypassing the switch contacts. Where starting is automatic, an electronic sensor, thermocouple, or bimetal switch provides power to the ignition module as needed. The Harper-Wyman Model 6520 Kool Lite(tm) module is typical of those found in Jenne-Aire and similar cook-tops. Input is 115 VAC, 4 mA, 50/60 Hz AC. C1 and D1 form a half wave doubler resulting in 60 Hz pulses with a peak of about 300 V and at point A and charges C2 to about 300 V through D2. R2, C3, and DL1 form a relaxation oscillator triggering SCR1 to dump the charge built up on C2 into T1 with a repetition rate of about 2 Hz. You know the type - a purplish light with an occasional (or constant) Zap! Zap! Zap! If you listen real closely, you may be able to hear the screams of the unfortunate insects as well :-). However, these devices are not selective and will obliterate friendly and useful bugs as well as unwanted pests. This is just a line powered voltage quadrupler. R1 and R2 provide current limiting when the strike occurs (and should someone come in contact with the grid). The lamp, FL1, includes the fluorescent bulb, ballast, and starter (if required). Devices designed for jumbo size bugs (or small rodents) may use slightly larger capacitors! This is your basic brute force approach! This is your ultimate simple bug zapper -- no power switch, although the metal plate that the transformer and other parts are mounted on is grounded. The AC input is rectified by D1 and as it builds up past the threshold of the sidac (D2, 100 V), SCR1 is triggered dumping a small energy storage capacitor (C1) through the primary of the HV transformer, T1. This generates a HV pulse in the secondary. In about .5 ms, the current drops low enough such that the SCR turns off. As long as the instantaneous input voltage remains above about 100 V, this sequence of events repeats producing a burst of 5 or 6 discharges per cycle of the 60 Hz AC input separated by approximately 13 ms of dead time. The transformer was totally potted so I could not easily determine anything about its construction other than its winding resistances and turns ratio (about 1:100). The secondary side consists of a voltage tripler for the negative output (HV-) and a simple rectifier for the positive output (HV+). This asymmetry is due to the nature of the unidirectional drive to the transformer primary. From my measurements, this circuit produces a total of around 10 kV between HV+ and HV-, at up to 5 uA. The output voltages are roughly equal plus and minus when referenced to point B. The secondary side circuitry can be easily modified or redesigned to provide a single positive or negative output or for higher or lower total voltage. Simply removing R4 will isolate it from the input and earth ground (assuming T1's insulation is adequate). Make sure power is actually getting to the high voltage portion of the unit. Test the wall socket and/or AC adapter or other power supply for proper voltage with a multimeter. Excessive dirt/dust/muck/moisture or physical damage or a misplaced paper clip may be shorting it out or resulting in arcing or corona (a strong aroma of ozone would be an indication of this). With such a small available current (only uA) it doesn't take much for contamination to be a problem. Thoroughly clean and dry the unit and check for shorts (with a multimeter between the HV electrodes and case) and then test it again. Your problems may be gone! If this doesn't help and the unit is not fully potted (in which case, replacement is the only option), check for shorted or open components, especially the power semiconductors. Well, maybe :-). This thing is about the size of a hot-dog and plugs into the cigarette lighter socket. It produces a bit of ozone and who knows what else. Whether there is any effect on air quality (beneficial or otherwise) or any other effects is questionable but it does contain a nice little high voltage circuit. T1 is constructed on a 1/4" diameter ferrite core. The D (Drive) and F (Feedback) windings are wound bifilar style (interleaved) directly on the core. The O (Output) winding is wound on a nylon sleeve which slips over the core and is split into 10 sections with an equal number of turns (100 each) with insulation in between them. DL1 to DL4 look like neon light bulbs with a single electrode. They glow like neon light bulbs when the circuit is powered and seem to capacitively couple the HV pulses to the grounded grid in such a way to generate ozone. I don't know if they are filled with special gas or are just weird neon light bulbs. Ultrasonic cleaning is a means of removing dirt and surface contamination from intricate and/or delicate parts using powerful high frequency sound waves in a liquid (water/detergent/solvent) bath. An ultrasonic cleaner contains a power oscillator driving a large piezoelectric transducer under the cleaning tank. Depending on capacity, these can be quite massive. A typical circuit is shown below. This is from a Branson Model 41-4000 which is typical of a small consumer grade unit. The H and N are Hot and Neutral of the 115 VAC line. WARNING: Line connected input. Use isolation transformer for safety when troubleshooting. The power transistor (Q1) and its associated components form an self excited driver for the piezo-transducer (PT1). I do not have specs on Q1 but based on the circuit, it probably has a Vceo rating of at least 500 V and power rating of at least 50 W.
Two windings on the transformer (T1, which is wound on a toroidal ferrite core) provide drive (D) and feedback (F) respectively. L1 along with the inherent capacitance of PT1 tunes the output circuit for maximum amplitude. The output of this (and similar units) are bursts of high frequency (10s to 100s of kHz) acoustic waves at a 60 Hz repetition rate. The characteristic sound these ultrasonic cleaners make during operation is due to the effects of the bursts occuring at 60 Hz since you cannot actually hear the ultrasonic frequencies they use. The frequency of the ultrasound is approximately 80 kHz for this unit with a maximum amplitude of about 460 VAC RMS (1,300 V p-p) for a 115 VAC input. WARNING: Do not run the device with an empty tank since it expects to have a proper load. Do not touch the bottom of the tank and avoid putting your paws into the cleaning solution while the power is on. I don't know what, if any, long term effects there may be but it isn't worth taking chances. The effects definitely feel strange. At high enough power levels, it could indeed pulverize bones as described below. Whether that could happen with the typical small ultrasonic cleaner, I don't know and am not about to find out! "While stationed on board the now-decommissioned submarine USS Hawkbill (SSN-666), I pondered this as well. One of my senior shipmates related a story of a sailor who had done that very act on his previous submarine. The guy put his feet it the cleaner while it was powered on. He remarked that it felt very good and relaxing. After a few minutes, he pulled his feet out, and as soon as he stood up and applied his full bodily weight on his feet, all the bones in his feet had shattered. He got permanent disability from it. Apparently, it had rattled his bones apart. Wow!" Where the device doesn't oscillate (it appears as dead as a door-nail), first check for obvious failures such as bad connections and cracked, scorched, or obliterated parts. To get inside probably requires removing the bottom cover (after pulling the plug and disposing of the cleaning solution!). CAUTION: Confirm that all large capacitors are discharged before touching anything inside! The semiconductors (Q1, D1, D2, D3) can be tested for shorts with a multimeter (see the document: Basic Testing of Semiconductor Devices. The transformer (T1) or inductor (L1) could have internal short circuits preventing proper operation and/or blowing other parts due to excessive load but this isn't kind of failure likely as you might think. However, where all the other parts test good but the cleaning action appears weak without any overheating, a L1 could be defective (open or other bad connections) detuning the output circuit. Where the transistor and/or fuse has blown, look for a visible burn mark on the transducer and/or test it (after disconnecting) with a multimeter. If there is a mark or your test shows anything less than infinite resistance, there may have been punch-through of the dielectric between the two plates. I don't know whether this could be caused by running the unit with nothing in the tank but it might be possible. If the damage is localized, you may be able to isolate the area of the hole by removing the metal electrode layer surrounding it to provide an insulating region 1/4 inch in diameter. This will change the resonant frequency of the output circuit a small amount but hopefully not enough to matter. You have nothing to lose since replacing the transducer is likely not worth it (and perhaps not even possible since it is probably solidly bonded to the bottom of the tank). 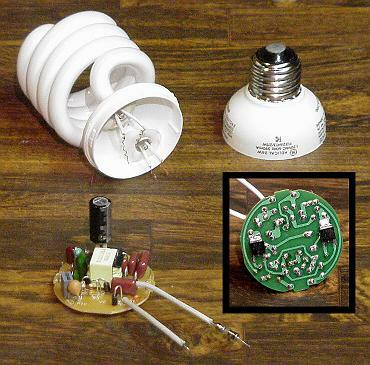 When testing, use a series light bulb to prevent the power transistor from blowing should there be a short circuit somewhere (see the document: Troubleshooting and Repair of Consumer Electronic Equipment) AND do not run the unit with and empty tank. Also see the info on ultraonic humidifiers in the document: Troubleshooting and Repair of Small Household Appliances. This is a (currently somewhat meager) collection of basic power supply circuits that will hopefully grow as time passes. Where a modest source of DC is required for an appliance or other device, it may be possible to add a rectifier and filter capacitor (and possibly a regulator as well) to a wall adapter with an AC output. While many wall adapter output DC, some - modems and some phone answering machines, for example - are just transformers and output low voltage AC. This is also the simplest and safest way to construct a small DC power supply as you do not need to deal with the 110 VAC at all. Bridge rectifier - turns AC into pulsating DC. Filter capacitor - smooths the output reducing its ripple. Regulator - produces a nearly constant output voltage. Depending on your needs, you may find a suitable wall adapter in your junk box (maybe from that 2400 baud modem that was all the rage a couple of years ago!). An AC input of Vin VRMS will result in a peak output of approximately 1.4 Vin - 1.4 V. The first factor of 1.4 results from the fact that the peak value of a sinusoid (the power line waveform) is 1.414 (sqrt(2)) times the RMS value. The second factor of 1.4 is due to the two diodes that are in series as part of the bridge rectifier. The fact that they are both about 1.4 is a total coincidence. Therefore, you will need to find an AC wall adapter that produces an output voltage which will result in something close to what you need. However, this may be a bit more difficult than it sounds since the nameplate rating of many wall adapters is not an accurate indication of what they actually produce especially when lightly loaded. Measuring the output is best. Select the filter capacitor to be at least 10,000 uF per 1000 mA of output current with a voltage rating of at least 2 x Vin. This rule of thumb will result in a ripple of less than 1 V p-p which will be acceptable for many devices or where a voltage regulator is used (but may be inadequate for some audio devices resulting in some 120 Hz hum. Use a larger or additional capacitor or a regulator in such a case. Suitable components can be purchased at any electronics distributor as well as Radio Shack. The bridge rectifier comes as a single unit or you can put one together from 1N400x diodes (the x can be anything from 1 to 7 for these low voltage applications). Observe the polarity for the filter capacitor! Example 1: A typical modem power pack is rated at 12 VAC but actually produces around 14 VAC at modest load (say half the nameplate current rating). This will result in about 17 to 18 VDC at the output of the rectifier and filter capacitor. Example 2: A cordless VAC battery charger adapter might produce 6 VAC. This would result in 6 to 7 VDC at the output of the rectifier and filter capacitor. Adding an IC regulator to either of these would permit an output of up to a fraction to 2.5 V (depending on type) less than the filtered DC voltage. For many applications, it is desirable to have a well regulated source of DC power. This may be the case when running equipment from batteries as well as from a wall adapter that outputs a DC voltage or the enhanced adapter described in the section: Converting an AC output wall adapter to DC. The following is a very basic introduction to the construction of a circuit with appropriate modifications will work for outputs in the range of about 1.25 to 35 V and currents up 1 A. This can also be used as the basis for a small general purpose power supply for use with electronics experiments. What you want is an IC called an 'adjustable voltage regulator'. The LM317 is one example - Radio Shack should have it along with a schematic. The LM317 looks like a power transistor but is a complete regulator on a chip. Note: Not all voltage regulator ICs use this pinout. If you are not using an LM317, double check its pinout - as well as all the other specifications. For a single output not referenced to a common, it doesn't matter whether a positive voltage regulator (as shown) or negative voltage regulator is used. However, were multiple power supplies like this are needed WITH a common point, negative voltage regulator ICs must be used for the negative ones. Note: Various manufacturers may label the pins differently than shown just to be confusing. For example, 1,3,2 instead of 1,2,3. However, the location of each pin will be the same so double check with the diagram. Vin should be at least 2.5V greater than Vout. Select a wall adapter with a voltage at least 2.5 V greater than your regulated output at full load. However, note that a typical adapter's voltage may vary quite a bit depending on manufacturer and load. You will have to select one that isn't too much greater than what you really want since this will add unnecessary wasted power in the device and additional heat dissipation. Maximum output current is 1 A. Your adapter must be capable of supplying the maximum current safely and without its voltage drooping below the requirement in (2) above. Additional filter capacitance (across C1) on the adapter's output may help (or be required) to reduce its ripple and thus the swing of its input. This may allow you to use an adapter with a lower output voltage and reduce the power dissipation in the regulator as well. Make sure you select a capacitor with a voltage rating at least 25% greater than the adapter's *unloaded* peak output voltage and observe the polarity! Note: wall adapters designed as battery chargers may not have any filter capacitors so this will definitely be needed with this type. Quick check: If the voltage on the adapter's output drops to zero as soon as it is pulled from the wall - even with no load - it does not have a filter capacitor. The tab of the LM317 is connected to the center pin - keep this in mind because the chip will have to be on a heat sink if it will be dissipating more than a watt or so. P = (Vout - Vin) * Iout. There are other considerations - check the datasheet for the LM317 particularly if you are running near the limits of 35 V and/or 1 A. For a negative output power supply, use the corresponding negative voltage regulator and note that their pinout is NOT the same as for the positive variety. See above! Note: Pinouts for 78 and 79 series parts are NOT the same! For an unregulated supply, take the outputs from V+ and V-. Since only half-wave rectification is used, the main filter caps, C1 and C2, should be at least twice the uF value compared to full wave or bridge circuits to obtain the same ripple. Another disadvantage of this configuration is that if the currents drawn from the outputs aren't equal, net DC flows through the transformer secondary (with a voltage doubler having no output connection to the common point, this isn't possible). Core saturation may result if operating near the transformer's maximum current ratings. By adding a PNP power transistor like a 2N2955 to either a fixed or adjustable regulator, maximum current can be easily increased. The circuit below will permit a very simple 3 to 5 A, 5 V power supply to be constructed assuming the power transformer/rectifier can supply this current. Q1 MUST be mounted on a large heat sink since it is dissipating power equal almost the entire output current times the difference between input and output voltage! Also, keep in mind that the filter capacitor(s) on the supply providing Vin must also be sized accordingly to keep ripple to a manageable level. The way this works is that once the current exceeds about Vbe(Q1)/5 A, Q1 turns on and bypasses current around the 7805. For a negative supply based on a 79xx regulator, use an NPN transistor like a 2N3055 and reverse the capacitor polarities. Don't forget that the pinout for the 79xx and other negative voltage regulators is NOT the same as for the positive variety. See the section: Adding an IC Regulator to a Wall Adapter or Battery. This adds a gain stage to improve regulation compared to the circuit in the section: Higher Current Operation and is shown using an adjustable regulator though a fixed regulator could also be used. This is similar to the circuit in the Texas Instruments LM317 datasheet. Although not specified, I expect this is good for up to 5 A or more depending on the actual voltage difference between input and output and the size of the heat sink used for the power transistor, Q2. * For proper regulation, RL must be low enough in value to guarantee at least a 30 mA current at the selected output voltage. It can be a separate resistor or part of the actual load. For even higher current operation, multiple power transistors (Q2) can be wired in parallel as a pass-bank with small (e.g., .1 ohm) emitter resistors to balance the load. In this case, Q1 may need to be a slightly bigger transistor and R4 reduced in value to provide adequate base drive. Details will depend on your particular needs. As with the other circuits, a negative power supply can be constructed by using the appropriate regulator IC, swapping NPN or PNP transistors, and reversing all the polarities of the capacitors and diode. I constructed this to provide a means of testing and experimenting with electronic flash circuits and (modifications to these circuits) that run on single Alkaline cells as their appetite for these is quite huge. See the section: Up to 350 VDC Inverter from 1.5 V Alkaline Cell. The power transformer (T1) that I used was actually rewound from one that was rated at 12 V, 1 A. This was a high quality transformer, so removing 2/3rds of the secondary was quite a pain. Actually, the purpose was an experiment to see if it could be done non-destructively. Conclusions: Just barely. :-) Obviously, a transformer actually designed to produce about 4 or 5 V at 3 A could also be used. D1 to D4 can be individual diodes or a bridge rated for at least 3 A. The regulator (IC1) is an LT1084CP which is similar to an LM317 but is a low dropout type rated at 5 A max. I had a pile of these left over from a certain multi-million dollar project that had been cancelled due to upper management foot in a** disease..... An external pass transistor may be needed to use an LM317 because of the peak current requirement. Despite the transformer only being rated for 1 A, with IC1 on a modest heatsink, the supply seems perfectly happy putting out 3 A at 1.5 V for an extended period. I don't know that I would run it all day at this high current but for my purposes, it seems fine. It turns out that the typical electronic flash circuit from a disposable camera like the Kodak MAX (see Schematic and Photo), actually draws more than 3 A at the start of its recharge cycle. So, the voltage does dip a bit but this doesn't affect much of anything. Recharge time with the power supply is at least as rapid as with a fresh Alkaline cell. The voltage from an Alkaline cell also dips a bit under these conditions. Obviously, the circuit could be easily modified to put out 2.4 VDC (for a pair of NiCd cells), 3 VDC (for two Alkalines), or whatever else you might need. A problem with most voltage doubler circuits is that the positive and negative outputs operate on alternate half-cycles so ripple is at the power line frequency rather than at twice the power line frequency. The transformer is also not utilized efficiently since only half of the secondary winding is passing current at any given time. Here is a cute circuit that gets around both these problems. The original article is at: George Hrischenko's Genuine Full Wave Voltage Doubler Page. The output voltage is approximately 2.8 times the RMS rating of the transformer secondary (primary not shown). Ripple is at 2X the power line frequency. Boost Supply to Produce Clean Regulated +12 VDC shows an approach for getting a higher voltage than +12 VDC from an unmodified PC power supply. In this specific case, a source of +12 VDC for an audio or instrumentation PCI card was needed to be derived from the normally noisy +12 VDC output of a standard PC power supply. Any filtering would reduce the voltage below an acceptable level. The 555 implements an oscillator that runs at somewhere around 50 kHz which drives the MOSFET chopper and stepdown transformer to generate a few VDC which is added to the original 12 VDC from the PC. This is then regulated down using the 7812. By only generating a few V boost (just enough for the dropout requirements of the linear regulator) rather than the full output voltage, the components can be smaller since less power is involved. Obviously, other voltages than +12 VDC can be produced in this manner - the example was a coincidence. This could also be done with fewer components using modern SMPS ICs designed DC-DC converter applications but I don't have any suggestions off-hand. This circuit was reverse engineered from the switching power supply from a Panasonic VCR. It is typical of the small switchers used in the Panasonic PV28XX, PV48XX, and many other models, their Magnavox clones, as well as other Matsushita manufactured VCRs. Many VCRs of other brands use similar designs. Errors in transcription are possible. Some models use additional outputs each fed from a single rectifier diode and filter capacitor (not shown). Some part numbers and the connector pinout may not be the same for your particular VCR. A totally dead supply with a blown fuse usually means a shorted switchmode power transistor, Q1. Check all other components before applying power after replacement as other parts may be bad as well. The most common problems resulting in low or incorrect outputs are dried up or leaky electrolytic capacitors - C4, C16, C17, C21. See the document: Notes on the Troubleshooting and Repair of Small Switchmode Power Supplies for more info. Get the schematic for VCRPS in PDF format: VCRPS-SCH. This is the complete schematic for the switchmode power supply (SMPS) from a small (probably 14 or 15 inch) "I guarantee you never heard of the brand name" SVGA color monitor. The AC line input and degauss components are at the upper left, the SMPS chopper, its controller, and feedback opto-isolator are in the lower left/middle, and the secondaries - some with additional regulation components - occupy the entire right side of this diagram. Even for relatively basic application such as this, the circuitry is quite complex. There are more than a half dozen separate outputs regulated in at least 3 different ways! The variable voltage B+ regulator is in the upper right corner. This provides an voltage to power the horizontal deflection which is determined by the video input. To maintain the same picture width, the required voltage to the horizontal output transistor/flyback needs to be roughly proportional to horizontal scan rate. Most of these circuits were reversed engineered from commercial products. The good news is that this means they probably all work somewhat reliably. The bad news is that a custom wound transformer (you can build in most cases) will be needed and there may be errors in the number of turns and wire sizes listed since these were all determined without totally dismembering the unit in question. However, the circuit described in the section: Super Simple Inverter" only requires off-the-shelf components but has a pitiful efficiency. But construction is, well, super simple :-). And, it should be easy to make modifications to the flash units from pocket or disposable cameras as described in the section: Up to 350 VDC Inverter from 1.5 V Alkaline Cell since these are quite readily available for free if you know where to ask! For more information on fluorescent and xenon lamps, see the documents: Fluorescent Lamps, Ballasts, and Fixtures and Notes on the Troubleshooting and Repair of Electronic Flash Units and Strobe Lights and Design Guidelines, Useful Circuits, and Schematics, respectively. This circuit can be used to power a small strobe or fluorescent lamp. It will generate over 400 VDC from a 12 VDC, 2.5 A power supply or an auto or marine battery. While size, weight, and efficiency are nothing to write home about - in fact, they are quite pitiful - all components are readily available (even from Radio Shack) and construction is very straightforward. No custom coils or transformers are required. If wired correctly, it will work. Output depends on input voltage. Adjust for your application. With the component values given, it will generate over 400 V from a 12 V supply and charge a 200 uF capacitor to 300 V in under 5 seconds. For your less intense applications, a fluorescent lamp can be powered directly from the secondary (without any other components). This works reasonably well with a F13-T5 or F15-T12 bulb (but don't expect super brightness). Q1 does get quite hot so use a good heat sink. Construction can take any convenient form - perf board, minibox, etc. Make sure the output connections are well insulated. C1 must be nonpolarized type - not an electrolytic. D1 provides a return path for the base drive and prevents significant reverse voltage on the B-E junction. Any 1 A or greater silicon diode should be fine. C2 is shown as typical energy storage capacitor for strobe applications. Remove D2 and C2 for use with a fluorescent lamps. D2 should be a high speed (fast recovery) rectifier. However, for testing, a 1N4007 should work well enough. R2 limits surge current through D2. The polarity of the input with respect to the output leads is important. Select for maximum voltage by interchanging the black output wires. Mount Q1 (2N3055) on a heat sink if continuous operation is desired. It will get warm. Other NPN power transistors with Vceo > 80 V, Ic > 2 A, and Hfe > 15 should work. For a PNP type, reverse the the polarities of the power supply and D1, and interchange one set of leads (where a diode is used for DC output). Some experimentation with component values may improve performance for your application. When testing, use a variable power supply so you get a feel for how much output voltage is produced for each input voltage. Component values are not critical but behavior under varying input/output voltage and load conditions will be affected by R1 and C1 (and the gain of your particular transistor). WARNING: Output is high voltage and dangerous even without large energy storage capacitor. With one, it can be lethal. Take appropriate precautions. ---+--- are connected;    ---|--- and ------- are NOT connected. The AmerTac Fluorescent Lamp Ballast is from a portable 12 V light made in China for American Tack & Hardware Co sold in Home Depot stores. It burned out after about 30 minutes of continuous use. (OK, maybe you shouldn't consider duplicating this exactly! --- Sam) So I decided to take it apart and see what was in there. What it had was a very small circuit board (about 1/2" x 2"). Both the transformer and the transistor were melted beyond recognition. The transformer was apparently custom made out of two 'E' cores taped together. I have another identical unit, so I could read the transistor part number: 2SD882. It is rated 80 V, 5 A, 40 W, typical Hfe of 30, in a TO127 package. Unlike many of the others, this circuit powers both both filaments in the tube but is otherwise very similar. I have another identical unit which hasn't been fried so I put a UV bulb in there and fired it up. It is clear that only one end has a glowing filament. It is the end connected to pins 5 & 6 of the transformer. The filament attached to pins 1 and 2 appears to only work as a resistor. The circuit will not operate without the bulb so I wasn't able to get reliable readings. The circuit below was reverse engineered from the Archer model number 61-3724 mini fluorescent/incandescent flashlight combo (no longer in the Radio Shack catalog). The entire inverter fits in a space of 1-1/8" x 1" x 3/4". It is powered by 3 C size Alkaline cells and drives a F4-T5 tube. This design can easily be modified for many other uses at lower or higher power. T1 is an E-core ferrite transformer. The core is 5/8" x 3/4" x 3/16" overall. The outer legs of the core are 1/8" thick. The central leg is 3/16" square. The square nylon bobbin has a diameter of 5/16". There is a .020" gap (spacer) in between the two halves of the E-core. The 315T O (Output) is wound first followed by the 28T D (Drive) and 28T F (Feedback) windings. There should be a strip of mylar insulating tape between each of the windings. The wire sizes were determined by matching the diameters of the visible ends of the wire for each winding to magnet wire of known AWG. The number of turns in the Output winding was determined based on its measured resistance, core diameter, and the wire gauge tables. A 50 kHz .1 V p-p signal was then injected into the Feedback winding. The amplitudes of the resulting outputs from the Drive and Output windings were then measured. From these, the ratios of the number of turns were calculated. The transistor was totally unmarked. A general purpose NPN medium power transistor like a 2N3053 or ECG24 should work. For PNP types, reverse the polarities of the power supply and C1. Since it is very low power, no heat sink is used in the Archer flashlight. However, for other applications, one may be needed. When testing, use a variable power supply so you get a feel for how much output voltage is produced for each input voltage. Component values are not critical but behavior under varying input/output voltage and load conditions will be affected by C2 and C3, the number of turns on each of the windings of T1, and the gain of your particular transistor. WARNING: Output is high voltage and dangerous. Take appropriate precautions. The circuit below was reverse engineered from the Energizer model number unknown (worn off) mini fluorescent/incandescent flashlight combo. The entire inverter fits in a space of 1-1/8" x 1-1/8" x 3/4". It is powered by 4 AA size Alkaline cells and drives a F4-T5 tube. This design is very similar to the Archer model (see the section: Archer Mini Flashlight Fluorescent Lamp Inverter, but eases starting requirements by actually heating one of the filaments of the T5 lamp. Thus, a lower voltage transformer can be used. T1 is an E-core ferrite transformer. The core is 1/2" x 5/8" x 3/16" overall. The outer legs of the core are 3/32" thick. The central leg is 3/16" square. The square nylon bobbin has a diameter of 5/16". There is a .010" (estimate) gap (spacer) in between the two halves of the E-core. The 160T O (Output) is wound first followed by the 16T H (Heater), 32T D (Drive), and 16 T F (Feedback) windings. There should be a strip of mylar insulating tape between each of the windings. A 100 kHz .1 V p-p signal was then injected into the Drive winding. The amplitudes and phases relationship of the resulting outputs from the Feedback, Heater, and Output windings were then measured. From these, the ratios of the number of turns and winding start/end were determined. The transistor was an MPX9610. I was not able to locate specs for this part number but a transistor like a 2N3053 or ECG24 should work. For PNP types, reverse the polarities of the power supply and C1. Since it is very low power, no heat sink is used in the Energizer flashlight. However, for other applications, one may be needed. This was reverse engineered from a toy pocket blacklight, made in China. It has been tested with tubes up to 6 W.
The original transistor is marked 8050 C0ZC. A 2N3055 works better than the original, the tube starts faster and the transistor runs much cooler. T1 is a ferrite E-core transformer measuring 17mm x 15mm x 15mm. The core seems to be 5 mm thick. The turns ratio has not been determined. Winding W1 is made of ~0.2 mm wire, the resistance is below 1 ohm. The data for winding W2 is the same as winding W1. Winding W3 is made of ~0.5 mm wire and its resistance is 5 ohms. The original tube is an F4T5BLB blacklight tube, but the inverter has been tested with an ordinary F4T5 tube as well as a Philips 6W tube. The 6W tube causes the original transistor to run quite hot, so using a 2N3055 or similar power NPN is recommended. 4.5V seems to be the absolute minimal voltage required to start an F4T5 tube. 5V will start the 6W tube when a 2N3055 transistor is used. Voltage can probably be cranked up above 12V, but that was the highest I tried (Didn't want to test when the tube blows). CAUTION: The inverter can give a nice(?) shock when run with the original transistor on 5V. With a 2N3055 and higher supply voltage, it can be nasty. Avoid touching the tube terminals. The bottom of the PCB can also give quite suprise, as I discovered :-(. Here's another schematic from a little light stick intended for use in a car at 12 V. It uses an F8T5 bulb and is quite similar to the Archer inverter (A HREF="#schamf">Archer Mini Flashlight Fluorescent Lamp Inverter) which, BTW, I've built successfully. :) Here's the ASCII schematic (I'm no ASCII wizard, so I took one out of your schematic collection and made the appropriate modifications). Or see the Automotive Light Stick Inverter in .gif format. It has got a long cable with a nice set of plugs - a pair of alligator clips as well as a cigarette lighter plug. It's made in China, cost the equivalent of $8 and could not be disassembled without cutting thick black rubber apart. I just experimented with rebuilding it a bit. It works fine with a home-made transformer using an E 25 core (25 mm core width, or 0.79"). I tried both an un-gapped (AL = 1750 nH) and a 0.4"-gapped (on central leg; AL = 151 nH) version. Concerning efficiency, the result was more or less the same, but due to the higher switching frequency with the gap, there was no buzzing sound from the transformer. It worked even with 32 primary and 350 secondary turns, secondary wound first with the output and feedback winding not side-by-side but one over another. It's also great as an inverter for use with a G4-T5 to erase EPROMs, as I discovered. Transistors with low gain don't seem to work well - BD237 and 2N5191 were reasonably good. It's easy to have it operate at more power - just decreasing the 5.1 k resistor and adding a small heatsink works great. The filter capacitor gets pretty warm; needs to be low ESR or it will probably overheat, especially at higher power levels. In the original inverter, there was a connection between the secondary and ground. Strange - it doesn't seem to make any sense because nothing changes if you remove it. But they have got their reasons, I suppose. The circuit below was reverse engineered from a model number FL-12 'Made in Hong Kong' battery (8 AA cells) or 12 V wall adapter powered portable fluorescent lamp. The bulb is an F8-T5. This design can easily be modified for many other uses at lower or higher power. Note that its topology is similar to that of the circuit described in the section: Super Simple Inverter. T1 is an E-core ferrite transformer. The core is 5/8" x 3/4" x 3/16" overall. The outer legs of the core are 3/32" thick. The central leg is 3/16" square. The square nylon bobbin has a diameter of 5/16". There is no visible spacer between the cores but I did not disassemble to confirm. The 350T O (Output) is wound first followed by the 25T D (Drive) and 18T F (Feedback) windings. There should be a strip of mylar insulating tape between each of the windings. The resistances of each of the windings was measured to determine the arrangement of the transformer. The inverter was run at just enough input voltage for it to oscillate (so the load of the fluorescent tube would not affect the readings) and the voltages on all 3 windings were measured on an oscilloscope. From this, the ratios for the windings were determined. An estimate was made of the number of turns likely to be on the Drive winding based on other similar designs. The number of turns on the other windings were calculated based on the turns ratios. Wire size is probably #36 AWG. The transistor was marked 5609 which I could not cross to anything. I would guess that a general purpose medium NPN power transistor like a 2N3053 or ECG24 should work. For a PNP type, reverse the polarities of the power supply and C1. Since it is very low power, no heat sink is used in this lamp. However, for other applications, one may be needed. When testing, use a variable power supply so you get a feel for how much output voltage is produced for each input voltage. Component values are not critical but behavior under varying input/output voltage and load conditions will be affected by C2, C3, R1, R2, the number of turns on each of the windings of T1, and the gain of your particular transistor. (From: Gary Perry (perry_gary@ascom.co.uk).) I used this circuit based on this design to build an EPROM eraser, using the 4 watt G4T5 germicidal tube. The tube seems to like 75 VAC in order to 'fire it up'. I used a 2N3053 transistor and a commonly available commercial 6 - 0 - 6 primary 240VAC 100mA secondary transformer. After 25 minutes constant usage, both transistor and transformer remained cool. A variable PSU was connected, and the circuit worked first time. The required 75 VAC output was achieved with only 5 VDC input. The circuit below is the type used in inexpensive fluorescent camping lanterns. In this particular model, an F6-T5 lamp was used. It will drive F4-T5 to F13-T5 tubes depending on input voltage. The power source can be a 4 to 9 V, 2 A power supply (depending on the size of your lamp) or a suitable battery pack. This design was reverse engineered from a random commercial unit of unknown manufacture using a lead-acid battery battery that expired long ago. The approximate measured operating parameters are shown in the chart below. The two values of input current are for starting/running (starting is with the Start button, S1, depressed. T1 is assembled on a square nylon bobbin, 3/8" cubed. Wind the 250T O (Output) first, insulate with mylar tape, 20T D (Drive) next, and 7T F/S (Feedback/Starting) last. Observe directions of windings as indicated by the dots (o). The number of turns for the O winding was estimated based on measured winding resistance, wire size, and the dimensions of the bobbin. The core is just a straight piece of ferrite 1/4" x 1/4" x 1-3/8" It is fully open - there is no gap. Any general purpose NPN power transistor with Vceo > 80 V, Ic > 2 A, and Hfe > 15 should work. For a PNP type, reverse the polarities of the power supply, C1, D1, and D2. Use a good heat sink for continuous operation at higher power levels (6 V input or above). The type used (2SC1826) was a replacement after I fried the unidentified transistor originally installed (103-SV2P001). Pushbutton switches are used to control operation. S1 (Start) provides initial base drive to the transistor via the Feedback/Starting winding of T1 until the tube arc is established. At that point, feedback is sustained via current flowing through the tube. S2 (Off) shorts the base of the transistor to ground to stop the oscillator. Like a regular manual start preheat fluorescent fixture, the start switch, must be depressed until the lamp comes on at full brightness indicating that the filaments are adequately heated. When testing, use a variable power supply so you get a feel for how much output voltage is produced for each input voltage. Component values are not critical but behavior under varying input/output voltage and load conditions will be affected by R1 and R2 (during starting in particular), the number of turns on each of the windings of T1, and the gain of your particular transistor. This circuit is capable of driving a variety of fluorescent lamps from a 4 to 12 V, 2 to 2.5 A DC power supply, rechargeable battery pack, or auto or marine battery. With appropriate modifications (if needed) it may be used for other applications like powering an electronic flash or HeNe laser tube. The transformer will need to be custom wound (by you) but this is not really difficult - just slightly time consuming for the 600 turn O (Output) winding if you don't have a coil winding machine. I have used it with fluorescent tubes of many sizes: F6-T5, F13-T5, F15-T12, and F20-T12. The arc will be sustained with the filaments hot on an input as low as about 3.5 to 4 V (with a new tube) but during starting, an input voltage of about 5 or 6 V may be needed until the filaments are hot enough to sustain the arc at the lower voltage. Two nearly identical circuits are shown. The following slightly modified design starts oscillating at a very low input voltage (under 2 V). This may be beneficial when driving small lamps. The circuit behaves quite similarly in all other respects. The switching frequency is about 21 kHz and varies less than 5 percent over the range of input voltage for which the bulb remains lit (it is significantly higher with no load - about 140 kHz). An input voltage of about 4 V is needed to start oscillation (reducing R1 or increasing R2 would lower this at the expense of efficiency at higher voltages) but it will continue well below 3 V.
The measured input current at various input voltages for two lamp types are shown in the chart below. SV (Starting Voltage) is the minimum input voltage required to preheat the filaments before the lamp will turn on (current is lower until filaments are hot). FB (Full Brightness) is the point at which the lamp appears to be operating at the same intensity as if it were installed in a normal 115 VAC fixture. T1 is an E-core ferrite transformer. Once complete, the cores are installed on the bobbin with a 2 mm gap. Some experimentation with the core gap may be needed to optimize performance for a given lamp type and input voltage. Each E core is 1" x 1/2" x 1/4" overall. The outer legs of the core are 1/8" thick. The central leg is 1/4" square. The square nylon bobbin has a diameter of 5/16" and length of 3/8". The 600T O (Output) is wound first followed by the 15T D (Drive) and 10T F (Feedback) windings. For convenience, wind the D and F windings bifiler style (the two wires together). Determine the appropriate connections with an ohmmeter (or label the ends). The centertaps are brought out to terminals. Try to distribute the O winding uniformly across the entire bobbin area by winding it in multiple layers. This will assure that no wires with a significant voltage difference are adjacent. There should be a strip of insulating tape between the O and the other windings. L1 isolates the power supply. It is 24 turns of #22 wire wound on a 1/4" ferrite core. The inverter works fine without L1 but seems to have a tad more strength at low voltage with it. The transistors are MJE3055T (2N3055 in a TO220 package) types but are not critical. However, I expect that some faster switching transistors would run cooler. Any fast switching NPN power transistor with Vceo > 80 V, Ic > 3 A, and Hfe > 15 should work. For PNP types, reverse the polarity of the power supply. For operation above about 6 V, a pair of good heat sinks will be required. However, power dissipation in the transistors does not seem to increase as much as expected - the base drive is probably more optimal at higher input voltage. When testing, use a variable power supply so you get a feel for how much output voltage is produced for each input voltage. Component values are not critical but behavior under varying input/output voltage and load conditions will be affected by C1, the number of turns on each of the windings of T1, the gap of the core of T1, and the gain of your particular transistor. If the circuit does not start oscillating, interchange the F winding connections to Q1 and Q2. For the good performance it is important to drive fluorescent tube by pure AC voltage. 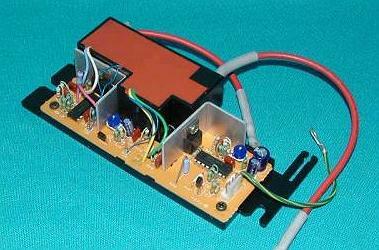 It may look strange, but simple flyback transformer drives the tube on DC, not AC! Look at one of the flyback circuits: when the transistor is conducting the primary windings get more and more current which produces storage of magnetic energy in the core of the transformer. At the point when the core saturates the base drive for the transistor is being suddenly cut off (this "suddenly" depends on the core material properties), and the stored energy is being transferred by the secondary winding to the tube as a high voltage pulse. Since the orientation of primary and secondary windings and the battery (e.g. accumulator) is always the same this pulse also has the same polarity every time. That's why only one side of the tube gets darker after it is being run on such inverter for some period of time, and that is why the tube can't perform well for some reasonable period of time with the flyback topology of the driver. Because there is one period within the flyback cycle when the transistor is only supplying the transformer with the magnetic energy and the tube doesn't get any portion of the energy during this period, the tube would probably turn off during this. That is not good at all. One of the biggest advantages of the electronic ballasts over older ballasts with the inductors (or transformers) is that the tube is run on high frequency so that it doesn't turn off at any time. There is no flicker but one more important consequence is that the tube need not be started at the beginning of every single cycle! That's why the tube has 10% more light power when being run on electronic ballasts. Naturally, the good ballasts have no "dead-time" in their operation cycles. For the long lifetime of the tube, many app-notes suggest sinusoidal form of the tube driving voltage, which is not the case with the flyback inverters. The tube voltage would be probably the very high voltage pulse at the very beginning of the tube supply period of the inverter cycle, and approx. 100V of continuous voltage at the rest of the cycle (all of these is during the period while the transistor is not conducting; while it does, the output voltage is 0 V). Since only one transistor is performing the switching job, it's current is at least two times bigger than if there were two of them, for the same output power of the inverter. For example, if the inverter gets constant current of 1 Amp from the power supply, the transistor's peak current would probably be greater then 2 Amps! So, it seams that far better topology for fluorescent tube inverters is symmetrical push-pull inverter, such the one described in "Medium Power Fluorescent Lamp Inverter". There is only slightly higher cost for this (one power transistor more), but also fewer resistors and capacitors! The output voltage of this circuit is alternating (+/-) square wave. The tube gets constant power supply (it lights during positive as well as during negative half-cycle, which means AC), and it doesn't turn off at all. It is good to preheat the electrodes of the tube before it is being started. There are some of the flybacks that does so, but during this period of operation the peaks of output voltage are even higher. Unfortunately, Medium Power... doesn't preheat the tube. This could be done by adding one high voltage capacitor in parallel with the tube. It's capacitance should be few times lower than the one in series with the tube... (read on :) Notice that the oscillating frequency of the inverter is around 7 times higher with no load (e.g., when the tube is not started yet). At this very high frequency this small capacitor's impedance is low enough so that considerable preheating current could flow through the filaments. Every simple compact fluorescent tube electronic ballast has one of these, the value of which is 2n2/1000V. I suggest using one of them or any with the similar properties. One additional good feature of this capacitor is that it heats the filaments of the electrodes even during normal operation of the tube but in much lower rate (about 5% of the preheating current). It may look as a fault but it doesn't. The lamp life would be longer if the filaments are hotter. High speed switching transistors could be the good choice but only if special "hard" ferrite core materials are used. These materials have very sharp hysteresis curve which means that they saturate fast and provide fast and clean switching pulse for the transistors. If normal core is used, fast switching transistors may not be of any benefit. Nevertheless, standard cores for ferrite transformers tend to be made of the "hard" materials (and these materials get better and cheaper) so it could be interesting for enthusiasts to experiment. Small capacitors in parallel with the base resistors help in starting the oscillations. Their value is not critical (0.33 to 2.2 nF). With a 12 VDC power supply, this resistor produces around 10% of power loss but if the compactness of the device is important, it is acceptable. Without it the transistors would dissipate almost the same amount of heat as resistor dissipates when is present, so I suggest using it anyway. The inverter runs much more stablely with it and the transistors are much less stressed, which ensures long and reliable operation of the inverter. All resistors are rated to 1/4 W except Re, which is 2 to 4 W.
My lamp has survived abt 20 hours being run on this circuit. I will send you an update if I notice something else useful or interesting. This unit is from a Techna-Bright EDXR-38-16 compact fluorescent lamp used as a (mediocre) replacement for the ubiquitous 150 W outdoor floodlight. It's a 3 U-section tube inside a light weight glass floodlight reflector. With a rated electrical input of only 16 W, I doubt it's even as bright as a 60 W incandescent lamp. The inverter is remarkably simple and must be dirt cheap to manufacture. It uses a pair of 400 V, 4 A bipolar transistors in a self-oscillating configuration which appears to have its output in resonance with a LC network in series with the lamp. The only magnetic components are an inductor for RFI suppression, an inductor in series with the lamp, and a driver transformer for the transistor bases (3 sets of 2 or 3 turns on a ferrite core). An RC and diac circuit provides a kick start to get it going. Protection of sorts (one time) consists of a fusable 0.47 ohm resistor in the AC line input. Get the schematic for CFLAMP1 in PDF format: CFLAMP1-SCH. The same basic circuit could be used on 220 to 240 VAC, 50 Hz but the voltage ratings of the filter capacitor and possibly the transistors would need to increase, and probably some other changes would be needed. However, note that these ballasts do not seem to be very tolerant of any sort of fault in the lamp circuit itself and may fail instantly if there is a short, open, intermittent connection, or wrong type or size lamp. Thus care should be taken if attempting to use the ballast to power anything other than the original lamp. Double check that all wiring is correct and secure before applying power. This unit is from a General Electric 26 W helical compact fluorescent lamp which is a fairly decent replacement for a 100 W incandescent lamp, but having just over 1/4 the energy consumption. The model number on the CFL is: FLE26HT3/2/SW. However, even what appear to be identical GE CFLs may have slightly different part numbers. The lamp, ballast (bottom view inset), and base are shown in Major Parts of General Electric Helical Compact Fluorescent Lamp. This inverter uses a pair of N and P channel 250 V, 2 to 2.5 A, MOSFETs in a self oscillating configuration with a transformer (actually labeled L3 on the schematic) boosting the half-bridge output voltage. (L3 may actually have at least one of its windings wired with Litz multistrand insulated wire based on the appearance of the wire ends at its terminals.) Gate drive feedback is via a series L-C circuit. A Positive Temperature Coefficient thermistor provides current to power the tube filaments and then increases to a high resistance while the lamp is running. This is easier on the filaments during starting but uses a bit extra power than might be possible with some sort of active switching circuit to disable them. Protection is provided by a real 1.5 A mini glass fuse wired directly to the center of the CFL screw base. Get the schematic for CFLAMP2 in PDF format: CFLAMP2-SCH. The same basic circuit could be used on 220 to 240 VAC, 50 Hz but the voltage ratings of the filter capacitor and MOSFETs would need to increase, the L3 turns-ratio would decrease, and probably some other changes would be needed. Construction was all done point-to-point - there is no circuit board. Layout appears not to be critical. T1 is a relatively large heavy laminated E-I core transformer. The E and I sheets alternate direction to assure a low reluctance magnetic circuit. The core dimensions are 3-3/4" x 3-1/8" x 1-1/8" overall. The outer legs of the core are 5/8" thick. The central leg is 1" wide. The square bobbin has a diameter of 1-3/8". The 360T O (Output) secondary is wound first as 4 or 5 insulated layers followed by the 31T D (Drive) and 17T F (Feedback) windings. There are insulating layers between each of the windings. The inverter was run and the amplitudes of the signals on each winding were measured. From these ratios, the number of turns were calculated. The transistor were marked 69-206. ECG29 is a close match - high power amplifier switch - 80 V, 50 A, 300 W, Hfe 20 min. 2SD797 is another readily available power transistor that should work. For PNP types, reverse the polarities of the power supply, C1, C2, and C3. The transistors are mounted on heat sinks which form the sides of the case. C3 and R3 are required for starting. Since there is no source of current for the bases of the transistors other than the Feedback windings, this provides a starting pulse to Q2 when the unit is switched on. Ramping the input voltage slowly rather than using the power switch would likely result in the inverter behaving like an inanimate object. Measured frequency of operation was about 56 Hz. This is likely affected by nearly everything - input voltage, capacitance, core saturation, phase of the moon, etc. Therefore, don't expect to drive a clock mechanism from this thing with any accuracy! When testing, use a variable power supply so you get a feel for how much output voltage is produced for each input voltage. Component values are not critical but behavior under varying input/output voltage and load conditions will be affected by C2 and C3, the number of turns on each of the windings of T1, and the gain of your particular transistors. However, See note (3) about starting. WARNING: Output is high voltage and dangerous - even more so if you increase its output for true HV applications. Over 200 W is available continuously. Take appropriate precautions. The specific circuit described below is derived from the inverter used in a Kodak "MAX" disposable camera electronic flash. The beauty of this approach is that the remains of these cameras are often available for the asking at 1 hour photo developing outfits since they are usually thrown away after extracting the film (though apparently some are recycled, this is probably the exception rather than the rule). The original Kodak MAX Flash Unit Schematic and Photo of Kodak MAX Flash Unit show what you get for nothing. All newer Kodak disposable cameras including the "Funsaver Sure Flash" and APS (Advanced Photo System) "ADVANTIX" appear to use a similar if not identical circuit but I haven't disassembled one of those as yet. This is certainly useful intact for strobe and high voltage projects but for the purposes of this discussion, all we need are T1 (which we may modify), Q1, R1, perhaps S1 or an equivalent, C1, and D1. By rewinding the inverter transformer, any output voltage up to about 350 VDC can be obtained from a 1.5 V Alkaline cell. More than 350 V is probably possible but just thinking about winding the needed secondary makes me tired! The Mini Power Supply Based on Modified Kodak MAX Inverter shows the simplified circuit. The original circuit board can be used and is very convenient though a more compact unit can be constructed if you use a bit of perf board or your on PCB. Note that for higher voltages, Q2 in the original MAX schematic may be needed. For low voltage operation, performance is much better without it. I don't know what the break-even point is so you may want to leave a spot for Q2 just in case. The main difficulty is in disassembling T1 in a nondestructive way. It seems that the ferrite core is held together by an adhesive which is very tough and resistant to any solvent that won't destroy the plastic bobbin and wire insulation as well. Therefore, you may need to sacrifice two of these - one so that just the ferrite core can be salvaged by soaking the transformer in some nasty solvent (maybe lacquer thinner will work) to dissolve the adhesive. assuming a small load on the output. So for: 4 VDC, N = 26; for 50 VDC, and for N = 256 300 VDC, N = 1506. The original circuit topped out at about 350 VDC with N = 1750. It may be possible to use multiple output windings to provide more than one output voltage but as will be shown below, all output power must be drawn on the forward stroke of the converter since the flyback pulse of the reverse stroke is needed to drive the voltage on C1 and the base of Q1 negative. I have done the modifications for the 4 VDC version by removing the original 1,750 turn secondary (I had to do this anyway so I could confirm the number of turns for the circuit description) and replacing it with a 26 turn winding of #32 wire. Unfortunately, I also had to Epoxy the half dozen pieces of the ferrite core back together after somewhat destructive disassembly but I don't think there are any significant gaps left in the core :-( (I confirmed that the transformer still worked by installing another set of undamaged original windings and checking that it still charged and fired the flash properly). With no load, the output reaches about 5 V in a fraction of a second. With a 100 ohm load, the output drops to a bit over 4 V.
Q1 bottoming-V is going to vary from about 0.1V to about 0.3V on the forward stroke, from no-load to full-load. D1 + Q1Vbe fwd-drop is going to similarly vary from about (0.7 + 0.35)V to (0.7 + 0.6)V.
V/C2(NLoad) = (1.5 - 0.1)26/6 - 1.05 = 5.02V. V/C2(Fload) = (1.5 - 0.3)26/6 - 1.3 = 3.9V. 4 V across 100 ohms is about 160 mW, not bad really. Well, I still haven't seen what recharges C1 negatively. Some scope waveforms for C1 and D1 would be nice (hint, hint). :)"
"Don't be, it was a pure fluke. The V-drops were only guesstimated and things like primary IR-drop were not even included." Well, IR-drop should be negligible - 4 inches of #26 wire is only about .013 ohms :-). I checked the waveform across B-E of Q1. It is around .6 V for most of the cycle with strong -6 V going spikes! So, where are they coming from???? I thought that maybe the relatively long recovery time of the standard-looking (though unknown markings) diode (D1) is providing enough reverse current to turn off the transistor. I tested this by subbing both a fast recovery and high efficiency rectifier - no difference. OK, well maybe just a bit better performance :-). Perhaps it still is the reverse current spike as the transistor switches off that drives the base hard to -6 V.
Monitoring the waveform ACROSS D1 - do you want to guess what it looks like? X of about 26 pF would result in an appropriate divider ratio. However, this sounds high for the layout and 26 turns. Then again, stranger things have happened :-). But, a combination of the reverse recovery conduction and higher capacitance at low voltage as the diode reverses could probably do it. "You will recall that I was puzzled about energy transfer on the fwd stroke only. That transformer is going to get stored energy on every fwd stroke, and yet there appears to be no means of dissipating that energy..... There is even no protection for the collector of the transistor. In fact, I would suspect that that is part of the design, in that they did not want the energy clamped by the primary, they needed it as a high voltage reverse dissipation in the secondary. Think varactor-action. For D1 being spiked from fwd conduction to 110 V negative I would suspect that a 26pF-equivalent for D1 is quite reasonable. Bearing in mind that we have an inherent reverse-Vbe clamp I would not even be surprised if D1 could also be allowed to avalanche." I just wonder how this design came about. The vast majority of these simple flash inverter circuits use the traditional blocking oscillator topology with a separate winding or portion of a winding for the base drive/feedback. (At this point I have taken a look at over a dozen different types.) This Kodak circuit appears to be unique in letting the high voltage (originally) winding serve double duty. It probably does save 5 cents in the manufacturing cost of the transformer by not having to have a separate winding. :-). "I worked for a chap once (one Jevon Crossthwaite, about 70 now if still alive) who could take a circuit and absolutely *squeeze* the last ounce of performance out of it. This is typical of what he would get up to. I did learn a lot from him, but only partially, because my inbuilt design nature is still yer brick outhouse. If there are any BOFs around; I think Jevon Crossthwaite, in his early days, worked for Sylvania and for George Philbrick (before and after Teledyne entered the scene), both in the States." See Jonathan's Electronic Ballast to Power HID Lamps from 12 VDC for a description and schematic of an inverter that will drive a variety of high intensity discharge lamps from low voltage DC. Or, just the schematic at Schematic of Jonathan's Electronic Ballast to Power HID Lamps from 12 VDC. Don't forget, there are many more electronic flash and strobe circuits in: Notes on the Troubleshooting and Repair of Electronic Flash Units and Strobe Lights and Design Guidelines, Useful Circuits, and Schematics. This circuit (referenced in the document: Notes on the Troubleshooting and Repair of Electronic Flash Units and Strobe Lights and Design Guidelines, Useful Circuits, and Schematics is designed to provide a variety of options in terms of repetition rate, flash intensity, and various repeat and triggering modes. Line operated voltage doubler power supply. Power transformer operated low voltage logic supply. Variable frequency repeat mode controlled by 555 timer. Selectable flash intensities of .2, 2, and 20 W-s.
Autorepeat speeds from .05 to 100 Hz. Note that the flashlamp will NOT operate at all intensities for these entire ranges due to recharge and power dissipation limitations. Get the schematic for STROBEX in PDF format: STROBEX-SCH. I'm building a super strobe bar! It has 8 strobe tubes under computer control. (Actually a PIC processor, but hey, computer is a computer.) I have all the stuff done except the control section, and I only have 2 of the 8 strobe units done due to the fact that I haven't found any more cheap cameras at the thrift store! (One Saturday morning's worth of garage sales and flea markets would remedy that! --- sam). It runs on 12 V, at up to 6 A, and can fire the tubes at a rate of about 8-10 times per second. The storage cap is a 210 uf, 330 V model; it gets to about 250 V to 300 V before firing; depending on how long it has had to charge. Because of this high speed, the tubes get shall we say, a little warm. (Well, maybe a lot warm --- sam). I have it set up at the moment driving two alternating 5 W-s tubes. I'm pumping them quite a bit too hard, as the electrodes start to glow after oh, about 5 seconds or so of continuous use. I know, a high class problem, indeed! My final assembly will have 8 tubes spaced about 8 inches apart on a 2x4, with a Plexiglass U-shaped enclosure with a nice 12 V fan blowing air through one end of the channel to cool the inverter and the tubes. Stay tuned. I have developed a cool little transformer circuit that seems to be very efficient. I built this inverter as tiny as I could make it. It runs off of 3V, and charges up a little 1 uf 250V cap all the way up in about 30 seconds; drawing about 5 to 8 mA in the process. The numbers by the windings tell the number of turns. The primary and feedback windings are #28, while the secondary is #46. Yes, #46! I could hardly tell what gauge it was, as it was almost too small to measure with my micrometer! It may be #44 or #45, but at these sizes, who knows? I used a trigger transformer for the wire. I used all the wire on it, to be exact; it all JUST fit on the little bobbin. The primary went on the core first, then the secondary, and finally the feedback winding. This order is very important. I used a ferrite bobbin and corresponding ferrite 'ring' that fit on it. The whole shebang was less than 1 cm in diameter, and about 3-5 mm high! I gave it a coat of wax to seal things up, and made the inverter circuit with surface-mount parts, which I then waxed onto the top. There are two wires in, and two wires out. It's enough to run a neon fairly brightly at 1.2 V, with a 3 ma current draw. These two circuits are based on the inverters from disposable camera flash units. While not having quite the fewest components, they have an advantage in that a simpler inverter transformer like the one in the Kodak MAX Flash with a single primary and single secondary winding can be used. (Some of the other flash inverters require either a separate feedback winding or an additional tap for the feedback.) Even so, the total space for either of these circuits excluding the battery, power switch, and energy storage capacitor may be less than 0.1 cubic inch! And the cost may be $0.00. The schematics are shown in Ultra-Compact 350 V Capacitor Charger. The only differences between the circuits are whether the HV output is positive or negative with respect to the input and whether one side of the battery and HV are in common. Otherwise, they should behave in a similar manner. (The Kodak MAX is negative output type 1). The versions using 2SD879 or 2SD965 (NPN) transistors for Q1 have both been tested and appear to work about equally well, charging a 120 uF 350 V photoflash capacitor (C2) to 350 V in about 10 seconds. (The 10 uF C2 shown is just an arbitrary example.). This was at least as fast as the original flash using the same transformer. The actual transformer used for these tests is from a newer flash and is somewhat smaller in size than the one found in the original MAX. It may be a more modern version of the MAX since the design and PCB layout look very similar but I don't know for sure. (See: Photo of Disposable Camera Flash Unit. Please contact me via the Sci.Electronics.Repair FAQ Email Links Page if you know for sure from which model camera this originated.) Using the larger transformer should result in a faster charging speed. The value of C1 isn't critical - almost anything will work though values between about 200 pF and 10 nF seem to be best. The versions using PNP transistors should work just as well as long as a transistor with similar gain to the NPN types are used. (The 2SB1050 or ECG12 might work but I have not confirmed this. The 2SA1585S and 2SB1395S, which were the actual transistors found in two versions of the flash from which the transformer I used were taken, oscillated but would have taken a few minutes to charge a 120 uF capacitor to a useful voltage. I assume their gain was too low. It's also possible that low gain samples of the 2SD879 or 2SD965 would not work well in the negative output circuit but all the ones I tried were fine though there was some variation in charging rate probably due to variations in gain. In the original flash circuit, an additional transistor in a quasi-Darlington configuration where the collector of the first transistor goes to the supply instead of the collector of the second transistor boosts the gain. This, of course, could be added to be sure of reliable operation.) If S1 is a momentary switch, the inverter will charge to a voltage based on the uF of the energy storage capacitor (C2) where there is no longer enough of a feedback pulse to maintain oscillation. With a C2 of 120 uF, this is between 250 and 300 VDC. (In the original flash circuit, with the additional transistor, the inverter would run to well above 300 VDC at which point the voltage limiter circuit turned it off.) The circuit then shuts off and will not restart until S1 is pressed again. If S1 remains on continuously, the inverter will run continuously. At an input of 1.5 VDC, the output will then top off at 350 to 400 VDC. The inverter may be shut off by shorting the base of Q1 to COM (either directly or via a transistor). However, note that except for the Kodak MAX configuration, note that I've only tested the circuits with S1 on permanently. I do not know if all configurations will work with a momentary switch. 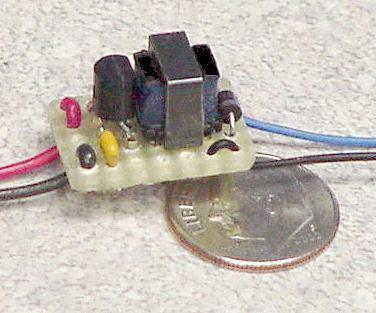 See Photo of Ultra-Compact 350 V Capacitor Charger for an example of the compact construction (shown sitting on a U.S. dime). The simplest source of power for these circuits is a single AA Alkaline cell. An alternative is the 1.5 V Alkaline Cell Eliminator. The peak current draw is several AMPs - anything that even slightly limits current will dramatically reduce the charging speed. DO NOT attempt to run on much more than 1.5 V as bad things may happen. If your circuit doesn't oscillate at all, reverse the connections to the primary or secondary of the transformer, but not both. There appears to be a slight difference in charging speed depending on which end of the HV winding goes to the HV rectifier. This is likely due to the interwinding capacitance or some other parasitic. Try both (reversing the primary as well) and pick the one that performs best. I'd expect the better one to be where the end of the HV winding goes to the HV rectifier. Other factors which affect charging rate are input circuit resistance (due to the high current) and stray capacitance. These circuits seemed to charge consistently more slowly (by about 10 to 20 percent) when tested on a solderless breadboard compared to the original flash unit or the construction shown in the photo, above. WARNING: Almost any uF value cap charged to 350+ VDC will result in a shocking experience if touched and may be lethal under the wrong conditions. Take care as potential danger of this little tiny circuit running from a 1.5 V battery easily be underestimated! This is a tunable RF generator based on a 6146A - a once popular "beam power tube", which I built about 30 years ago and recently resurrected in conjunction with my laser activities. It is a basic Hartley oscillator capable of at least 15 watts of RF output when powered from a 400 VDC, 100 mA power supply (of the same vintage and also recently resurrected). My most accurate power estimates are based on the "fluorescent lamp brightness test" and when driving a 15 W light bulb as a dummy load. :) The 15 W bulb runs best when attached to a 25 turn, 1 inch diameter air-core coil inserted into the main tuning coil (L2). Impress kids of all ages: Look, it lights with no wires! However, depending on the tuning and loading cap settings, the oscillator may not start when the bulb is cold (due to its much lower filament resistance and thus too much load) and fully inserted into L2 - it must be partially withdrawn to start up. Much more than 15 W could likely be generated by powering the system from a higher voltage input (the 6146A's maximum ratings exceed 725 V and 250 mA). I make no other claims about this circuit either in terms of efficiency or output purity - I know that it produces all sorts of harmonics which mess up local (at least) radio and TV reception depending on the setting of its tuning cap. Schematic in GIF format: Sam's 6146A RF Power Oscillator. These are the type of common triac based light dimmers (e.g., replacements for standard wall switches) widely available at hardware stores and home centers. CAUTION: However, note that a dimmer should not be wired to control an outlet since it would be possible to plug a device into the outlet which might be incompatible with the dimmer resulting in a safety or fire hazard. While designed for incandescent or heating loads only, these will generally work to some extent with universal motors as well as fluorescent lamps down to about 30 to 50 percent brightness. Long term reliability is unknown for these non-supported applications. The first schematic is of a normal (2-way) inexpensive dimmer - in fact this contains just about the minimal number of components to work at all! S1 is part of the control assembly which includes R1. The rheostat, R1, varies the amount of resistance in the RC trigger circuit. The enables the firing angle of the triac to be adjusted throughout nearly the entire length of each half cycle of the power line AC waveform. When fired early in the cycle, the light is bright; when fired late in the cycle, the light is dimmed. Due to some unavoidable (at least for these cheap dimmers) interaction between the load and the line, there is some hysteresis with respect to the dimmest setting: It will be necessary to turn up the control a little beyond the point where it turns fully off to get the light to come back on again. There are at least two varieties of inexpensive 3-way style dimmer switches which differ mainly in the switch configuration, not the dimmer circuitry. You will probably have no reliable way of telling them apart without testing or disassembly. None of the simple 3-way dimmer controls permit totally independent dimming from multiple locations. With some, a dimmer can be installed at only one switch location. Fully electronic approaches (e.g., 'X10') using master programmers and addressable slave modules can be used to control the intensity of light fixtures or switch appliances on or off from anywhere in the house. However, for one simple, if inelegant, approach to independent dimming, see the section: Independent Dimming from Two Locations - Lludge #3251. The schematic below is of one that is essentially a normal 3-way switch with the dimmer in series with the common wire. Only one of these should be installed in a 3-way circuit. The other switch should be a normal 3-way type. Otherwise, the setting of the dimmer at one location will always affect the behavior of the other one (only when the remote dimmer is at its highest setting - full on - will the local dimmer have a full range and vice-versa). Note that the primary difference between this 3-way dimmer schematic and the normal dimmer schematic shown above is the addition of an SPDT switch - which is exactly what is in a regular 3-way wall switch. However, this dimmer also includes a choke (L1) and capacitor (C2) to suppress Radio Frequency Interference (RFI). Operation is otherwise identical to that of the simpler circuit. This type of 3-way dimmer can be used at only one end of a multiple switch circuit. All the other switches should be conventional 3-way or 4-way types. Thus, control of brightness is possible only from one location. The schematic below is of a 3-way dimmer with a slightly more complex switching arrangement such that when the local dimmer is set to full on or full off, it is bypassed. (If you ignore the intermediate dimming range of the control, it behaves just like a normal 3-way switch.) With this scheme, it is possible to have dimmers at both locations without the dimmer circuitry ever being in series and resulting in peculiar behavior. (If dimming interacts, interchange the A and B wires to the silver screws at one dimmer). This one uses a toggle style potentiometer where the up and down positions operate the switches. Therefore, it has 3 states: Brass to Silver 1 (fully up), dim between Brass and Silver 1 (intermediate positions), and Brass to Silver 2 (fully down). However, it is still not possible to have totally independent control - local behavior differs based on the setting of the remote dimmer (details left as an exercise for the reader). Like the previous circuit, this dimmer also includes a choke (L1) and capacitor (C3) to suppress Radio Frequency Interference (RFI). It is just a coincidence (or a matter of cost) that the 3-way dimmers have RFI filters and the 2-way type shown above does not. As usual, the brass screw on the fixture or outlet should be connected to the Hot side of the wiring and the silver screw to the Neutral side. Note that as drawn, you need 4 wires between switch/dimmer locations. 4-way switches are basically interchange devices - the connections are either an X as shown or straight across. While not as common as 3-way switches, they are available in your favorite decorator colors. If using Romex type cable in between the two locations, make sure to tape or paint the ends of the white wires black to indicate that they may be Hot as required by Code. And, yes, such a scheme will meet Code if constructed using proper wiring techniques. Here is a schematic of a typical 'dumb'toaster oven/broiler - one without a P5-1000 chip if you can believe such a thing exists. :) Most of the complexity of these simple devices is actually in the sheet metal of the toast release mechanism! Like the more elaborate unit described in the section: Toastmaster Toaster Oven/Broiler with Electronic Controls, there is a knob for control of the oven/broiler functions and another for toast Light/Dark. A separate lever engages the toast function which terminates when the toast is done. You will note that other than that unit having an IC for toast timing, the basic circuits are almost the same. Apparently, the only real difference between a "toaster oven" and a "toaster oven/broiler" is that the latter has a means of disabling the bottom heating element while in oven (non-timed) mode - and, of course, the price! The heating elements are either Calrod(tm) type or Nichrome wire coils, possibly enclosed in quartz tubes. A single knob selects OFF (full CCW, S1A open), oven temperature S1B opens at selected temperature), and BROIL (full CW, S1C open). Some models may have a separate both/top only switch. The Toast Timer can be a mechanical timer and/or a bimetal or other toast temperature sensor. Individual details will vary but when the toast is ready, they will both release the Toast Lever and open S2 as well as possibly signaling with a bell. The Light/Dark control may vary time or the temperature at which toast is considered 'done'. This diagram is not based on any particular model. The toast function and oven/broiler are controlled separately. A single Power/Temperature/Broil knob controls the oven/broiler. This is entirely electro-mechanical with a conventional bimetal thermostat. Toast darkness is based only on time using CD4541B timer chip to release a manually activated Toast lever. Older 'dumber' toasters often were more sophisticated in their operation using a combination of time and temperature. Not this one. Its conventional counterpart would be identical except using a mechanical and/or toast temperature sensor in place of the IC timer. Despite what you might think, the most likely failures are NOT in the 'high-tech' electronics but the usual burnt out heating element(s), bad cord or plug, broken wires, and tired switches. Here are circuit diagrams from several inexpensive rechargeable flashlights. and an electric toothbrush. These all use very 'low-tech' chargers so battery life may not be as long as possible and energy is used at all times when plugged into an AC outlet. The electric toothbrush schematic is more interesting since it uses a high frequency inductive coupling rather than a direct connection. This one is typical of combined all-in-one units using a lead-acid battery that extends a pair of prongs to directly plug into the wall socket for charging. It is a really simple, basic charger. However, after first tracing out the circuit, I figured only the engineers at First Alert knew what all the diodes were for - or maybe not :-). But after some reflection and rearrangement of diodes, it all makes much more sense: C1 limits the current from the AC line to the bridge rectifier formed by D1 to D4. The diode string, D5 to D8 (in conjunction with D9) form a poor-man's zener to limit voltage across BT1 to just over 2 V.
The Series 50 uses a sealed lead-acid battery that looks like a multi-cell pack but probably is just a funny shaped single cell since its terminal voltage is only 2 V.
Another model from First Alert, the Series 15 uses a very similar charging circuit with a Gates Cyclon sealed lead-acid single cell battery, 2 V, 2.5 A-h, about the size of a normal Alkaline D-cell. WARNING: Like many of these inexpensive rechargeable devices with built-in charging circuitry, there is NO line isolation. Therefore, all current carrying parts of the circuit must be insulated from the user - don't go opening up the case while it is plugged in! This uses a 3 cell (3.6 V) NiCd pack (about 1 A-h). The charging circuit is about as simple as it gets! I could not open the transformer without dynamite but I made measurements of open circuit voltage and short circuit current to determine the value of R1. I assume that R1 is actually at least in part the effective series resistance of the transformer itself. Similar circuits are found in all sorts of inexpensive rechargeable devices. These have no brains so they trickle charge continuously. Aside from wasting energy, this may not be good for the longevity of some types of batteries (but that is another can of worms). This is another flashlight that uses NiCd batteries. The charger is very simple - a series capacitor to limit current followed by a bridge rectifier. There is an added wrinkle which provides a blinking light option in addition to the usual steady beam. This will also activate automatically should there be a power failure while the unit is charging if the switch is in the 'blink' position. This was found in an Interplak Model PB-12 electric toothbrush but similar designs are used in other appliances that need to be as tightly sealed as possible. A coil in the charging base (always plugged in and on) couples to a mating coil in the hand unit to form a step down transformer. The transistor, Q1, is used as an oscillator at about 60 kHz which results in much more efficient energy transfer via the air core coupling than if the system were run at 60 Hz. The amplitude of the oscillations varies with the full wave rectifier 120 Hz unfiltered DC power but the frequency is relatively constant. +-+-+  +--|>|--|--+   .01uF ---   /          CR5   |     E4 ) 1-1/2"
The battery charger is nothing more than a diode to rectifier the signal coupled from the charging base. Thus, the battery is on constant trickle charge as long as the hand unit is set in the base. The battery pack is a pair of AA NiCd cells, probably about 500 mA-h.
For the toothbrush, a 4 position switch selects between Off, Low, Medium, and High (S1B) and another set of contacts (S1A) also is activated by the same slide mechanism. The motor is a medium size permanent magnet type with carbon brushes. When there is enough voltage from the solar cell, Q1 is turned on and Q2 (the LED driver) is turned off. As far as I can tell, there is nothing to actually limit current to the LED except for the combination of battery, transistors, LED, and wiring resistance. Both transistors could probably be replaced with 2N3904s. So, if you were duplicating this thing, I'd recommend adding something to control the current to the LED or at least checking it first! Actual failure of this complex device would most likely be due to worn out NiCd cells or corrosion to due exposure to the weather. Operational problems like weak output or inadequate lighting time could be due to insufficient Sunlight (the thing is installed under a bush!) or extended cloudy conditions. Of course, these don't produce a huge amount of light in any case! This is an astable multivibrator using discrete parts. Yes, I know, low tech but you can actually fondle all the internal points of interest that way :-). The time constant of R1*C1 and R2*C2 determine the blink rate. (Try 50K, 10 uF to start for a visible blink rate). You can also put an LED in series with one or both of the collector resistors (to blink alternately) and do away with any additional buffers. For very low Cs, stray capacitance and device frequency response will limit highest frequency. For very large Cs and/or very large Rs, leakage will limit lowest frequency. For very large Rs, gain of transistors may be inadquate. For very small Rs, transistors may melt down :-). Note: C1 and C2 can be either non-polarized or polarized (electrolytic) types. If polarized (e.g., to obtain higher capacitance values for lower operating frequencies), install the capacitors in the direction shown. |    |      |  |      |    +----/\/\----| Q3         NPN transistor. Question for the student: What happens if one or both Cs are replaced by resistors? +----+-----o|  >-----> To clock input (positive edge or pulse). This is a sort of brain teaser since it certainly isn't intuitively obvious how this circuit works (if it works at all). It may be instructive to start with the degenerate case of 2 resistors, 2 neon lamps, and a single capacitor. What happens with that configuration? Connect a .22 uF, 200 V capacitor between each of the following pairs of points: A to C, A to D, B to D, B to E, C to E.
Neons will flash in sequence ABCDE if fed off DC. Momentarily removing the DC will cause them to flash EDCBA. Hint (sort of): This system may NOT do what would be expected when simulated on a computer unless certain conditions are met. What are they? From an ancient Radio Shack "Pbox" kit - the first kit I ever built! The sequential flasher circuit is very old, going back to the 1950s at least. Operation follows classic neon light theory. As the voltage rises on the lamps, one will reach threshold first, and fire. That drops the voltage (via caps) on the two connected lamps, and to a lesser degree on the lamps those are connected to. The caps will charge through the resistors and one of the far lamps will finally reach threshold and fire. The process goes on from there. If you really want a strange one, draw 5 points in a circle. Then draw lines between the points. You will have a star inside of a pentagon. Replace each line with a 0.1 uF cap. Replace each point with a neon lamp and resistor. Resistor goes to +v and lamp. Other side of lamp to ground. (polarity doesn't really matter, just needs DC). Similar to your circuit, except more caps. Power it up and the bulbs will flash in some 5 step pattern, which will repeat until you interrupt power. Only one lamp on at a time. There are a whole lot of neon lamp circuits like this one. It is possible to build logic elements and flip-flops from them. I suppose one could build a computer with enough parts, although I don't know of anyone who had the patience. This allows a low voltage AC (or +DC for that matter) signal to drive a relay. Here are a pair of circuits that will light an LED when powered from a single 1.5 V alkaline cell. They should also operate on the 1.2 V output of a NiCd or NiMH cell as well as from a supercapacitor or ultracapacitor charged to 1 to 1.5 V.
Both circuits and the descriptions below have been contributed by: Andre De-guerin (mandoline@gtonline.net). This circuit utilizes the voltage doubling principle to flash an LED from a 1.5 source like a single alkaline cell. In addition, it can be dark activated by gating pin 5 of U1 with an LDR (Light Dependent Resistor) and resistor. The current drain is less than 40 uA between flashes. The LED current is 50 mA peak so it's quite bright. The original source for this circuit is from the ZSCT1555 Application Notes and a standard voltage doubler which was slightly modified so I could use a resistor instead of a diode. Not exactly new, but just a novel use of existing components as it isn't in any literature since the standard 555 timer works down to 3 V whereas this one works down to 0.9 V.
Using a 1 Farad supercapacitor charged to 1.5 V as the power source, the LED flashed for about eight hours. There was no change in oscillator frequency and the brightness stayed constant down to about 1.0 volts. The original source of the this circuit was at: Circuitos Corporation under "LED Flasher" (along with many other interesting schematics). However, the original design used an ORP12 as the sensor instead of an LED. And it didn't work. Evidently, it was never tested. With only a minor modification (increase C2 to 0.1 uF) a similar flasher can be built with a MAX660. This provides a slightly higher output current and it will flash reliably with a larger time delay between flashes (like up to a minute with a 3.3 uF capacitor). I found that connecting pin 1 to ground made the circuit more stable. It will flash a blue or white LED if the circuit is run from a 3 V battery. To get maximum output from the LED, replace C1 with a 1,000 uF electrolytic and the circuit makes a good night-time flasher for model rocketry. If it's low current you are after, the circuit will work with an LED series resistor. You can also use a N channel JFET with gate wired to source in series with the LED in order to limit the flash current to between 1 and 3 mA. Also, use a tantalum bead capacitor for C1. It works well and allows the 7660 to run from up to 24 VDC down to 5 VDC. I set one up last night and it works well using a 4069 as the flasher and it draws 10 uA. I have tested this circuit and it runs from a 4 F supercapacitor for eight hours without the above modifications. A possible improvement would be to use a constant current source in series with a 1 F, 5.5 V supercapacitor in order to maximize the flash time. This uses a single white LED to implement something that looks like a flashlight though it probably wouldn't win any awards for brightness. The challenge in such a circuit was to run a white LED with a 4+ V drop off a pair of AA batteries. This cute little circuit does it. In fact, it will run (at reduced brightness) at 1.5 V or less. See: Brinkmann LED Light. The oscillator circuit runs at about 200 kHz producing a more or less squarewave voltage waveform across the LED with a peak of 4.5 to 5 V on fresh AA batteries. At reduced input voltage, the frequency is a bit lower and there is a longer low time as well as slightly reduced peak voltage. R2 and/or R3 would typically be variable resistors. The time constant (R1+R2)*C1 controls the charge (high) time. The time constant (R1+R3)*C1 controls the discharge (low) time. The time constant (R1+R2+R3)*C1 controls the total time. R1*C1 controls the minimum length of the charge (high) time. R2*C1 controls the minimum length of the discharge (low) time.